Amtrak's Sunset Limited, Westbound is Amtrak's train #1. 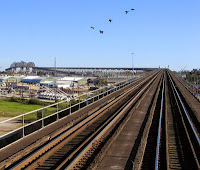 It rolls from New Orleans ~ Amtrak's Gulf Coast rail-head. On time usually at 9am ~ three days a week. It travels the historically designated Old Spanish Trail all the way to Los Angeles, California ~ its West Coast rail-head. 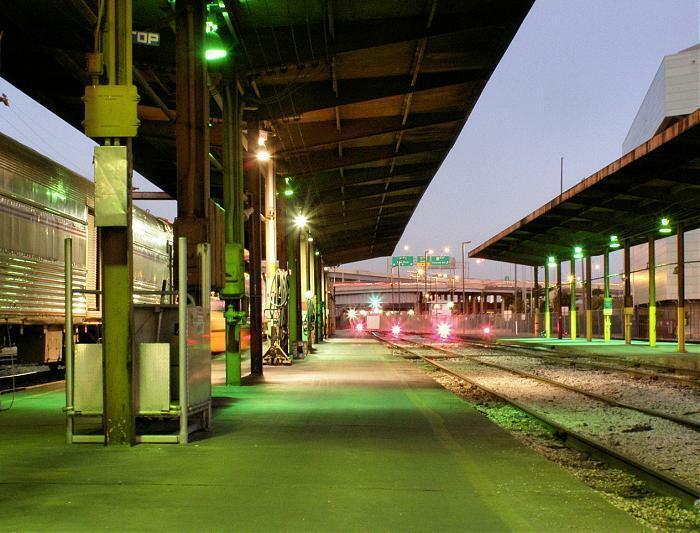 This is the oldest continually operating railroad line in America, and the first to carry a name: Sunset Limited. 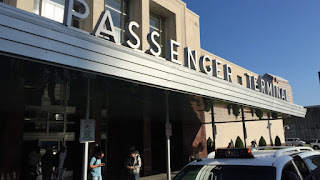 "Louisianans see themselves as living on America's Third Coast," L. A. Norma tells our pedicab driver as we pull up to the Union Passenger Terminal's side-entrance, facing New Orleans' Main Post Office and parking high-rise. We are running late. The Sunset Limited's Engineer is blowing his final safety whistle ~ the famed 'Last Call' ~ as we tug our bags through the glass doors. The whistle is still echoing inside the station. I dash for the loading platform's gate. Behind it I see our train and the coach Conductor picking up the yellow steps used when boarding. Norma spots a one-dollar bill on the floor and stops to pick it up, and step on the smoking Camel Cigarette she has illegally brought inside. I reach the gate along with three security guards, the Conductor ~ his attention now turned to us ~ and a familiar looking clerk from behind the ticket booth who says she recognizes me as a regular. The first guard hits me with the order to, "FREEZE!" I freeze. Norma catches up. I explain to the security people about the foot race, and having to walk from near City Hall, and the pedicab we caught on this side of Poydras Street that was stranded from the French Quarter by this same foot race! The security guards nod that they know of the race. "Other folks done missed trains," a lady guard grinned and inhaled deeply. "They are OK," the ticket clerk said, once again. The Conductor motioned for them to let us pass, and we rushed on board just as the forward Conductor waved towards the head of the train. The Engineer blew a final last-call, and we pulled away towards The Golden West. "Mercedes Benz, née Louisiana Superdome," Norma muttered. We found our seats, and Norma asked our car's attendant, "Why, if they sold Louisiana's Super Dome to Mercedes Benz, why didn't the money go to Louisiana taxpayers instead of Louisiana footballers?" The Train Attendant shrugged and asked our destination. He pushed a little yellow card in the slot-holder above our seats. 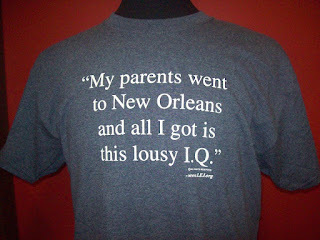 On it were the letters LFT, for Lafayette, Louisiana. We are bound for Festival International de Louisiane, Lafayette, one of the Muse's best festivals. There is hardly a day of the week when a quarter dozen Sunset Limiteds or more are not whistling through the deserts, climbing over mountains, crossing wide rivers, or idling on sidetracks ~ awaiting hundred-car freighters making way for their passage. 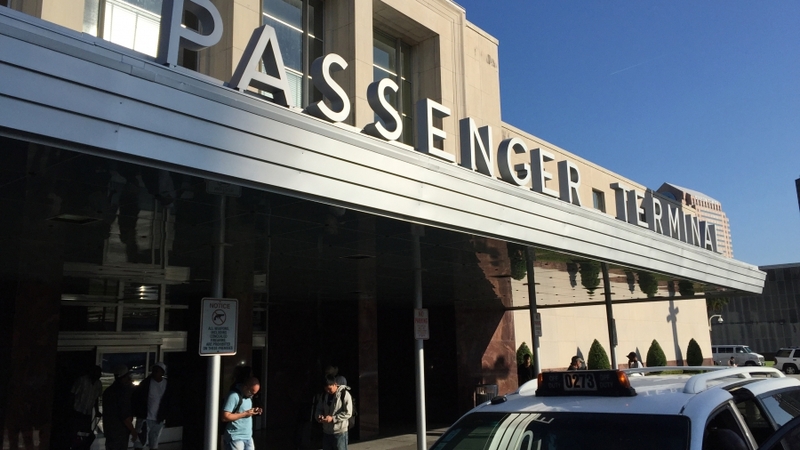 Federal law gives priority of passage to passenger trains, the conductor explained, while taking our ticket information and checking it on his hand held phone, "but there is not a sidetrack long enough to accommodate the longer freight trains." We just left the station and already we have stopped. We await our turn at the ramp up to the Huey P. Long Bridge. Giant seabirds fly over. We sit watching gleaming oily black tank cars slipping past, one-by-one slowly making way for our passage across The Mississippi River. Spring, so grand a time! Hot grease splatters on the grill, old folks dance with the young, and Music fills the air! We have been in Big Swamp City for the fabulous French Quarter Festival, and other events. Our heart dances, our ears ring, and our tummy bulges. 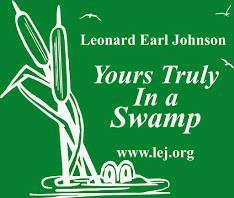 That the food is good in Louisiana nearly goes without saying, but where would columnism be if one didn't say it? and were charmed by its piano-playing ambiance overladen on their good kitchen and colorful remembrance of Huey P. Long ~ whose nickname was Kingfish ~ photos of the great governor hang from the walls. We plotted one evening, around the KINGFISH's piano, to attend a Louisiana Historical Society lecture on Huey P. Long at a grand Saint Charles Avenue mansion. "It will be a chance to hear of Huey from an Irishman's accent," Norma advised. Alex McManus was the Irishman. 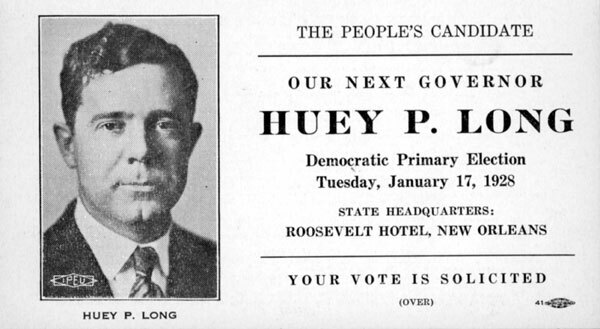 His talk was, "What did Huey Long's enemies mean when they called him a fascist?" "They meant he was goin'a tax Standard Oil!" Norma giggled over her third glass of wine. We hoped for fireworks from some Society members ~ they likely being descendants of the taxed ~ during the question and answer session. But there was none. Over refreshing wine and feta/spinach flatbread, I asked McManus about this, "What with such talk swirling in the wake of our twittering President." McManus said he, too, was surprised at the lack of such questions. L. A. Norma added that Americans are politically illeterate, and do not know the difference between faschism and populism. "Politicians blather about 'conservative values' to fog up the issue, and whip us in line. Instead of serveing our communal needs, which they label 'bad government.' They have us calling 'bad' what everyone else in the world calls good government!" "Over something under the rug," she said. forgotten rail passengers, please, before blocking access to the Union Passenger Terminal.